*It was brought to our attention that our blogs were not being distributed properly over the past month. This blog was from last week, and we will send out the current weeks blog later this week. We apologize for the inconvenience. But I’m not pretending. And now I have research to back me up. Researchers from an Oxford Economics study and MagnifyMoney.com have compiled a study ranking all 50 states on 20 factors in the categories of health, lifestyle, and prosperity. Based on an analysis of those elements, their study found the state where you live may impact your baseline level of well-being and happiness. Where does South Dakota rank? (Drumroll, please.) Second. This is not surprising to the 877,790 of us who live here. But it may be a shock to those who think it must be a real sacrifice to live in such a remote place. I can feel the pain of those of you who extol the virtues of living in the perceived paradises of Hawaii (#16), Texas, (#20), California (#21), Florida (#29), Michigan (#36) and New York (#39). Which states make up the top 10? 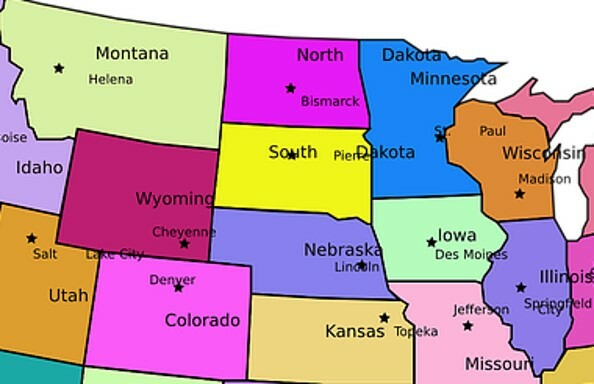 In order, they are Minnesota, South Dakota, Colorado, Utah, North Dakota, Wisconsin, Nebraska, Iowa, New Hampshire, and Montana. If you draw a circle with a 500-mile radius and Rapid City at the center, you will catch eight of them. This area, known as the Great Plains and Mountain West region, is sometimes called “flyover country ” by those living on the coasts. I realize some of you may be descending into denial with thoughts like, “The study must be flawed,” “Who could be happy in a place it snows,” or “South Dakota must have bought off the researchers.” So here are the details. In the specific categories, South Dakota ranked first in health, 20th in lifestyle, and second in prosperity. I found the prosperity ranking interesting, as one of the complaints I often hear is that wages are so low here. That is absolutely true when you compare the average salary of South Dakotans with the average salary of those living on the East or West coasts. But consider a few other crucial factors. Just as a rate of return on an investment is meaningless without considering the inflation rate, the number of dollars earned is meaningless without considering the cost of living and tax burdens. In this regard, someone in South Dakota who earns just 60% as much as someone in New York City, Washington D.C., or San Francisco has a better lifestyle and pays far less in state and local taxes than their higher-earning counterparts. I was a bit dismayed that we ranked only 20th in lifestyle, but this made more sense when I understood that two of the components were the number of hours spent outside of work and the volunteer rate. South Dakotans have a very high work ethic, which results in them working longer and volunteering less. The flip side of being workaholics is that we earn more, relatively speaking. Maybe that’s a contributing reason to our number-two prosperity ranking. In our number-one category, health, two components were air quality and getting enough sleep. Having traveled to many urban areas, I greatly appreciate our unpolluted air. I’m not sure why we sleep longer. Given our work ethic, maybe most of us go to bed early so we can get up early and be on time for work.